Lok Satta Party national President Dr. Jayaprakash Narayan today demanded that Prime Minister Dr. Manmohan Singh resign immediately as he has lost the moral right to rule the country even for a day longer. The sooner he quits the better it is for the politics, economy and governance of the country. Addressing a media conference on the outcome of the Rajasthan, Delhi, Madhya Pradesh and Chattisgarh Assembly elections, Dr. JP asked the Prime Minister to appreciate that the people have unequivocally rejected the Congress which has ruined the economy, divided the country, and is steeped in monumental corruption and dynastic politics. Dr. JP said that the Aam Admi Party’s spectacular show marks the beginning of the end of traditional politics. It is a victory for the movement launched by the Lok Satta Party 17 years ago for ushering in alternative politics. The traditional parties should introspect and mend their politics instead of viewing AAP’s performance as a political challenge. They should recognize that the days of garnering votes through vote buying, fielding criminals and perpetuating dynasties are over. Dr. JP said that people were seething with indignation over UPA rule for more than nine years now. It was for the first time after 1977 -- barring the 1984 extraordinary election in the wake of Mrs. Indira Gandhi’s assassination -- that people had given a second term for the ruling party. UPA’s failures have been colossal. It has failed to fulfill its promises on providing quality education and healthcare, eradicating poverty, creating livelihood opportunities, decentralizing administration and mitigating corruption. The economy is in a shambles. To cite one instance, power projects involving an investment of Rs.4,80,000 crore are stalled for want of clearances and gas and coal. People’s resentment against the Congress is so deep that they roundly defeated the Shiela Dikshit’s Government despite its relatively better performance and decimated it in Rajasthan. And they rewarded the relatively good BJP Governance in both Madhya Pradesh and Chattisgarh. The BJP’s victories cannot be attributed to a single person like Mr. Narender Modi and added that success has many fathers. Dr. JP, who whole-heartedly congratulated the Aam Admi Party and its President Arvind Kejriwal, said the Lok Satta felt proud of its achievement in Delhi because it represented a triumph of alternative politics pioneered by the Lok Satta. The AAP debut is compelling in that it could withstand the money power, influence and organizational strength of traditional parties. Although the Lok Satta has been the architect of many reforms, it has failed in marketing its accomplishments. It has been in the forefront in the movements for ensuring remunerative prices to farmers, restricting liquor consumption, decentralization of administration and per capita devolution of funds on local bodies, formation of village courts and extension of Government services to citizens as a matter of right. Yet, it has not mastered the art of taking its successes to people and succeed in elections like the AAP. It will have to attract poorer sections without committing any mistakes in the process. Dr. JP said the cosmopolitan nature of Delhi and its high per capita incomes and it being the epicenter of agitations against corruption and atrocities on women have enabled the AAP to stage its impressive show. 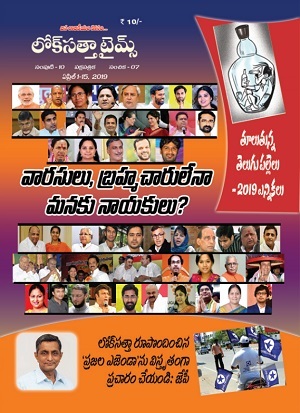 In contrast, the situation in Andhra Pradesh is highly polarized with all traditional parties exploiting caste, religion, region and language and offering money, liquor and sops for votes. In reply to a question, Dr. JP said that the Lok Satta would think of electoral alliances if they were to help it accomplish its goals and pursue its agenda. Dr. JP said that one heartening feature of the elections in the four States is that people who have hitherto detested politics and politicians have exercised their franchise. State Lok Satta Party President Katari Srinivasa Rao, Vice Presidents D. V. V. S. Varma and Y. D. Rama Rao, General Secretary Ravi Martuh and Disciplinary Committee Secretary L. V. Ramaraju took part in the media meet. How can LSP shamelessly claim a part of LSP's victory . If victory of AAP is sign of new politics, what does the dismal performance of LSP indicate? Leadership is one of the most observed and least understood phenomena on earth. If we know all too much about our leaders, we know far too little about 'leadership'. Definitely Lok Satta enjoys the pioneer -leadership-advantage of comprehensive new politics in India. Loksatta and AAP have to pool resources for forthcoming elections especially in states like AP and Karnataka. Have to decide if this is by merging and poll alliance. 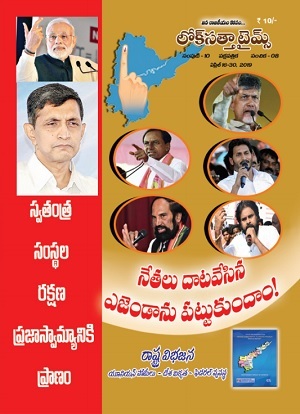 I realize that Loksatta has been a pioneer in movements RTI, disclosure of politicians background etc. If both stand for good governance and for people ideology nothing wrong in Loksatta merging with AAP. With AAP money raising capability, organization and media exposure will help. Better to do this sooner rather than later. There are only few(basic) difference between AAP and LSP s strategies to reach common man. 1) JP says traditional parties failed and corrupted. So, educate them, and teach them but do not hate them, and give due respect for their good deeds. AK says traditional parties are corrupted. So, hate them and teach them. 2) AK did not allow any other party to share the dais during Anna movement, and JP allowed all parties when he did 2/3 days fasting. 3) AK is impatient, and shows the anger against traditional parties. But JP is not. JP do not show the anger like AK. 4) AK showed some daredevil acts (like bringing out the Mukesh Ambani's links with BJP, and Congress, and Vadra's links with DLF.etc. ), which brought some momentary popularity. JP knew all these things, but never did these things, as he thinks that these trigger hatred. This is the reason why all parties hate AAP, and but respect LSP. LSP should learn how to show anger. This is one of the major differences between AAP, and LSP. Regarding the fourth point, Dr.JP filed case in supreme court for the cancellation of 2G licences and he was successful in that. Dr.JP and LSP always went against the system and never went against the people. I don't think, Dr.JP would change that attitude. By the way, these days, Dr.JP is also showing anger. Nobody would have taken seriously the Aam Aadmi Party if it had lost in Delhi. But everybody continues to pay attention to Lok Satta Party irrespective of its electoral performance. People for Lok Satta (PFL) was formed by the NRIs without even knowing Dr.JP personally and in the same manner many voted for Lok Satta in recent Karnataka assembly polls. These explain the fundamental difference between AAP and Lok Satta Party. AAP’s goals are temporary and limited, whereas Lok Satta’s goals are comprehensive and in the long-term interest of the public. AAP fits in Lok Satta, but Lok Satta won’t fit in AAP. It is not the question of individuals, AAP has serious people working for change, but it is about ideology, agenda, political culture and vision. It will prove disastrous to the public good in the long run, to merge Lok Satta with AAP. Winning elections is a different issue. Techniques and transactions used for winning can not guarantee transformation. Lok Satta basically came for transformation. The rest must fall within that framework. But when AAP’s success is speaking, these truths get less attention. So better AAP and Lok Satta Party work together as far as possible in the larger interests of India.